This used to span St Aldate’s and was in line with the surviving part of the South City Wall that runs alongthe north side of Brewer Street. The bus in the above picture would be on the point of passing through the gate on its way out of Oxford. It is possible that the name “Aldate” may be a contraction of “Old Gate”, rather than the name of a saint. The remains of the gate were demolished (or fell down) in the mid-seventeenth century. A hundred years later the street names still recalled its existence: Fish Street ended at this point and Grandpont (which continues down to Folly Bridge) began. 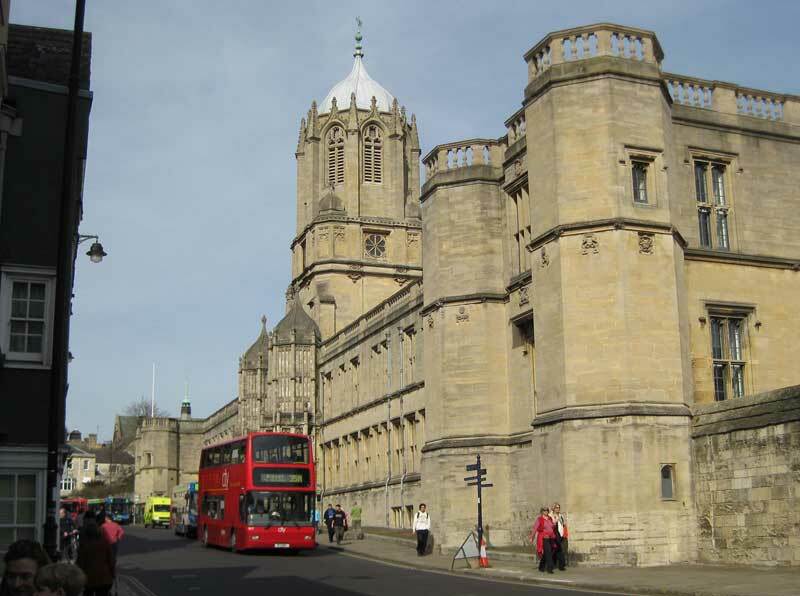 Until the sixteenth century, St Michael-at-the-Southgate Church stood near the South Gate into Oxford. In 1525 it was closed and demolished along with a section of the wall to make way for the great quadrangle of Cardinal College (now Christ Church) and its parish was united with St Aldate’s.